7MM Winchester Short Magnum (WSM)160 grain Nosler AccuBond- The 7mm Winchester Short Magnum is a twenty-eight caliber centerfire rifle cartridge developed in partnership with Browning Arms Company and Winchester, making its debut and introduced to the shooting public in 2001. The new 7mm short magnum cartridge is chambered in Winchester’s Model 70 bolt action rifle. The 7mm WSM is a commercial cartridge based on the 404 jeffery cartridge case, shortening to 2.100″ and necking down to .284″ caliber and sharpening the shoulder angle to 35 degrees. The 7mm WSM cartridge achieves its useful purpose as an excellent long range cartridge for, mule deer, sheep, black bear and elk, .284″ caliber is a time proven caliber for elk and deer size game animals. The 7mm WSM cartridge is a well thought out cartridge as Winchester is no stranger in .284″ caliber cartridge development. Winchester has now developed 2 cartridges in this caliber; (284 Winchester in 1963), and (7mm WSM in 2001). The 7mm WSM loadings show a velocity of 2910 feet per second for a 160 grain bullet for deer and sheep hunting and this translates to moderate recoil for the shooter with plenty of bullet energy at the 500 yard mark to flatten a larger deer size animal. The 7mm WSM cartridge, chambered in a short actioned light-weight rifle may well be the ultimate combination for a superb mountain rifle, that offers a slight increase in bullet frontal mass and energy than that offered by the 270 WSM in rugged terrain and most rifles chambered in this cartridge show plenty of accuracy with long range 160 grain weight bullets. 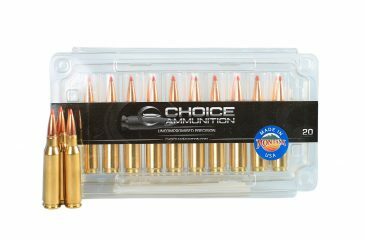 Choice Ammunition has taken our 100% hand-loading techniques and produce an extremely accurate, highly dependable round for the 7mm Winchester Short Magnum (WSM) in this load. Our loading tolerances are only matched by passionate hand-loaders in their own loading rooms. Consistent seating depths, powder charges and proprietary formulas of Choice Ammunition, make this 160 grain Nosler AccuBond round the best you can buy on the commercial market today. 7MM Winchester Short Magnum (WSM)162 grain Hornady ELD-X- The 7mm Winchester Short Magnum is a twenty-eight caliber centerfire rifle cartridge developed in partnership with Browning Arms Company and Winchester, making its debut and introduced to the shooting public in 2001. The new 7mm short magnum cartridge is chambered in Winchester’s Model 70 bolt action rifle. The 7mm WSM is a commercial cartridge based on the 404 jeffery cartridge case, shortening to 2.100″ and necking down to .284″ caliber and sharpening the shoulder angle to 35 degrees. The 7mm WSM cartridge achieves its useful purpose as an excellent long range cartridge for, mule deer, sheep, black bear and elk, .284″ caliber is a time proven caliber for elk and deer size game animals. The 7mm WSM cartridge is a well thought out cartridge as Winchester is no stranger in .284″ caliber cartridge development. Winchester has now developed 2 cartridges in this caliber; (284 Winchester in 1963), and (7mm WSM in 2001). 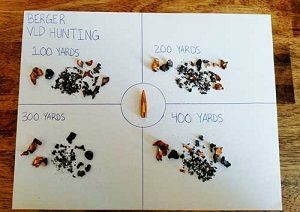 The 7mm WSM loadings show a velocity of 2,950 feet per second for a 162 grain bullet for deer and sheep hunting and this translates to moderate recoil for the shooter with plenty of bullet energy at the 500 yard mark to flatten a larger deer size animal. Our 100% Hand-Loaded 162 grain Hornady ELD-X rounds are loaded with extremely tight tolerances, producing highly accurate, consistent and reliable performance with each and every shot! Our proprietary load formulas and loading process create the finest round of ammunition available on the commercial market today we feel. If you don’t load your own ammunition- let us do it for you! 7MM Winchester Short Magnum (WSM)168 grain Berger VLD-Hunting- The 7mm Winchester Short Magnum is a twenty-eight caliber centerfire rifle cartridge developed in partnership with Browning Arms Company and Winchester, making its debut and introduced to the shooting public in 2001. The new 7mm short magnum cartridge is chambered in Winchester’s Model 70 bolt action rifle. The 7mm WSM is a commercial cartridge based on the 404 jeffery cartridge case, shortening to 2.100″ and necking down to .284″ caliber and sharpening the shoulder angle to 35 degrees. The 7mm WSM cartridge achieves its useful purpose as an excellent long range cartridge for, mule deer, sheep, black bear and elk, .284″ caliber is a time proven caliber for elk and deer size game animals. The 7mm WSM cartridge is a well thought out cartridge as Winchester is no stranger in .284″ caliber cartridge development. Winchester has now developed 2 cartridges in this caliber; (284 Winchester in 1963), and (7mm WSM in 2001). 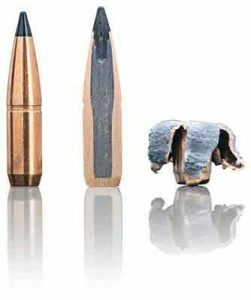 The 7mm WSM loadings show a velocity of 2900 feet per second for a 168 grain bullet for deer and sheep hunting and this translates to moderate recoil for the shooter with plenty of bullet energy at the 500 yard mark to flatten a larger deer size animal. 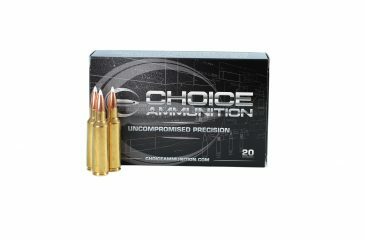 Choice Ammunition has taken our 100% hand-loading techniques and produce an extremely accurate, highly dependable round for the 7mm Winchester Short Magnum (WSM) in this load. Our loading tolerances are only matched by passionate hand-loaders in their own loading rooms. Consistent seating depths, powder charges and proprietary formulas of Choice Ammunition, make this 168 grain Berger VLD-Hunting round the best you can buy on the commercial market today. 7MM Winchester Short Magnum (WSM)140 grain Nosler Accubond- The 7mm Winchester Short Magnum is a new twenty-eight caliber centerfire rifle cartridge developed in partnership with Browning Arms Company and Winchester, making its debut and introduced to the shooting public in 2001. The new 7mm short magnum cartridge is chambered in Winchester’s Model 70 bolt action rifle. The 7mm WSM is a commercial cartridge based on the 404 jeffery cartridge case, shortening to 2.100″ and necking down to .284″ caliber and sharpening the shoulder angle to 35 degrees. The new 7mm WSM cartridge offers plenty of case capacity for tailored handloads. The 7mm WSM cartridge achieves its useful purpose as an excellent long range cartridge for, mule deer, sheep, black bear and elk, .284″ caliber is a time proven caliber for elk and deer size game animals. The 7mm WSM cartridge is a well thought out cartridge as Winchester is no stranger in .284″ caliber cartridge development. Winchester has now developed 2 cartridges in this caliber; (284 Winchester in 1963), and (7mm WSM in 2001). The 7mm WSM factory loadings show a velocity of 3,225 feet per second for a 140 grain bullet for deer and sheep hunting and this translates to moderate recoil for the shooter with plenty of bullet energy at the 500 yard mark to flatten a larger deer size animal. Choice Ammunition has taken our 100% hand-loading techniques and produce an extremely accurate, highly dependable round for the 7mm Winchester Short Magnum (WSM) in this load. Our loading tolerances are only matched by passionate hand-loaders in their own loading rooms. Consistent seating depths, powder charges and proprietary formulas of Choice Ammunition, make this 140 grain Nosler AccuBond round the best you can buy on the commercial market today. 7MM Winchester Short Magnum (WSM)140 grain Nosler Accubond- The 7mm Winchester Short Magnum is a twenty-eight caliber centerfire rifle cartridge developed in partnership with Browning Arms Company and Winchester, making its debut and introduced to the shooting public in 2001. The new 7mm short magnum cartridge is chambered in Winchester’s Model 70 bolt action rifle. The 7mm WSM is a commercial cartridge based on the 404 jeffery cartridge case, shortening to 2.100″ and necking down to .284″ caliber and sharpening the shoulder angle to 35 degrees. The 7mm WSM cartridge achieves its useful purpose as an excellent long range cartridge for, mule deer, sheep, black bear and elk, .284″ caliber is a time proven caliber for elk and deer size game animals. The 7mm WSM cartridge is a well thought out cartridge as Winchester is no stranger in .284″ caliber cartridge development. Winchester has now developed 2 cartridges in this caliber; (284 Winchester in 1963), and (7mm WSM in 2001). The 7mm WSM factory loadings show a velocity of 3,250 feet per second for a 140 grain bullet for deer and sheep hunting and this translates to moderate recoil for the shooter with plenty of bullet energy at the 500 yard mark to flatten a larger deer size animal. 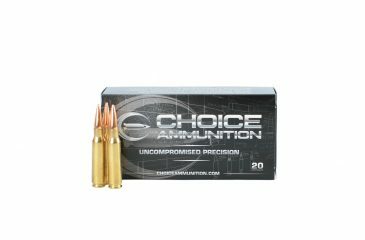 Choice Ammunition has taken our 100% hand-loading techniques and produce an extremely accurate, highly dependable round for the 7mm Winchester Short Magnum (WSM) in this load. Our loading tolerances are only matched by passionate hand-loaders in their own loading rooms. Consistent seating depths, powder charges and proprietary formulas of Choice Ammunition, make this 150 grain Nosler Partition round the best you can buy on the commercial market today. 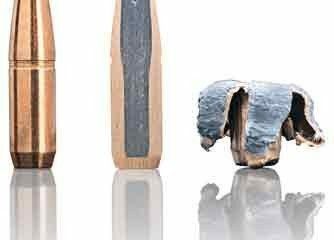 Partition Bullets feature a fully tapered jacket that ruptures instantly at the thin jacket mouth, yet the gradual thickening along the bullet’s axis controls expansion and curls the jacket uniformly outward at high or low velocities. This makes this round no match for Deer, Sheep, Pronghorn and Black Bear and other medium-sized game. 7MM Winchester Short Magnum (WSM) 150 grain Swift Scirocco- The 7mm Winchester Short Magnum is a twenty-eight caliber centerfire rifle cartridge developed in partnership with Browning Arms Company and Winchester, making its debut and introduced to the shooting public in 2001. The new 7mm short magnum cartridge is chambered in Winchester’s Model 70 bolt action rifle. The 7mm WSM is a commercial cartridge based on the 404 jeffery cartridge case, shortening to 2.100″ and necking down to .284″ caliber and sharpening the shoulder angle to 35 degrees. The 7mm WSM cartridge achieves its useful purpose as an excellent long range cartridge for, mule deer, sheep, black bear and elk, .284″ caliber is a time proven caliber for elk and deer size game animals. The 7mm WSM cartridge is a well thought out cartridge as Winchester is no stranger in .284″ caliber cartridge development. Winchester has now developed 2 cartridges in this caliber; (284 Winchester in 1963), and (7mm WSM in 2001). The 7mm WSM factory loadings show a velocity of 3,005 feet per second for a 150 grain bullet for deer and sheep hunting and this translates to moderate recoil for the shooter with plenty of bullet energy at the 500 yard mark to flatten a larger deer size animal. 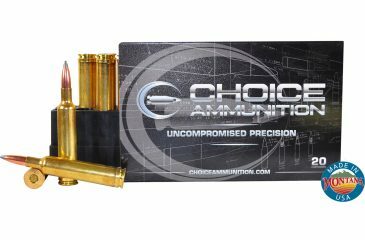 Choice Ammunition has taken our 100% hand-loading techniques and produce an extremely accurate, highly dependable round for the 7mm Winchester Short Magnum (WSM) in this load. Our loading tolerances are only matched by passionate hand-loaders in their own loading rooms. Consistent seating depths, powder charges and proprietary formulas of Choice Ammunition, make this 150 grain Swift Scirocco round the best you can buy on the commercial market today.